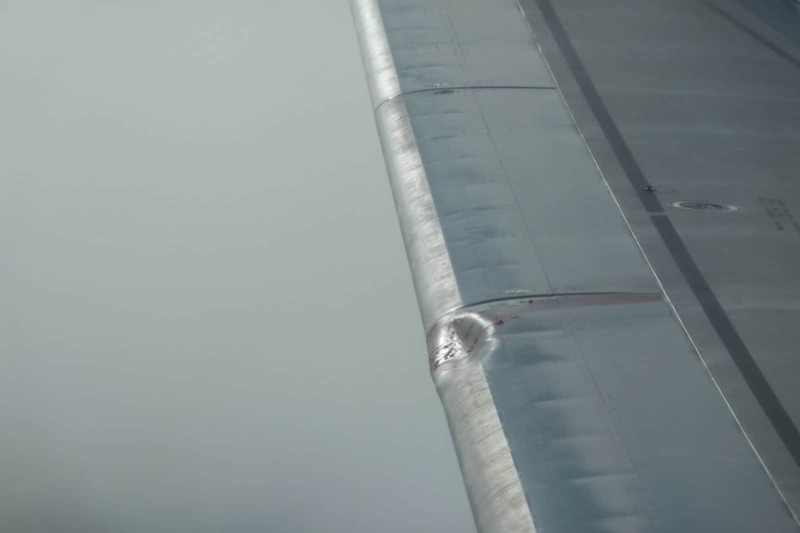 The right wing of Air Canada Flight 548 after the bird strike shows evidence of the impact. My husband, who loves taking photographs from airplane windows, caught this bird strike on camera. Vancouver, B.C. – We were seated in Row 12, directly behind the first class cabin on an Airbus A319 heading from Vancouver to Newark when I heard a loud, sudden thump on my side of the plane. Although I’m generally not fearful of flying, I do startle whenever there’s an unusual airplane noise on a plane. My heart started beating faster. A pilot asking to look out the window mid-flight certainly isn’t a routine occurrence. My ever-vigilant husband told him he had noticed something white fly past his window towards the right wing of the aircraft, which was only a couple rows behind us. Ironically, I always tease my husband because he takes photos from airplane windows when the clouds look pretty much the same to me regardless of where we are. He had his camera in hand this time, too. He clicked a few shots with his telephoto lens and showed me a picture of a dent in the wing with blood on it. I nearly gasped. “We were hit by a flock of seagulls,” explained the co-captain as he quickly wedged his way back to the aisle and headed towards the cockpit. Within a few minutes, an announcement came over the speaker system informing everyone that we had to return to the airport to see whether there had been any serious damage to the plane. We had been victims of a B.A.S.H. (Bird Aircraft Strike Hazard), the technical term used when a bird and an aircraft collide. USAir Flight 1549, “The Miracle on the Hudson,” is still a vivid memory for many air passengers, especially New Yorkers like me. In January 2009, Captain Chessy Sullenberger made a heroic emergency landing on the Hudson River after his Airbus A320 experienced engine failure soon after takeoff. The National Transportation Safety Board determined that a flock of Canadian geese had compromised two engines after they had ingested the birds. Our B.A.S.H was on the wing itself so the pilot was able to safely return to the airport in Vancouver. When we disembarked, we were told our plane was “unserviceable” because of the damage it sustained on the wing, and that we would have to wait for another one to arrive from Calgary. We experienced a five-hour delay and arrived home at 3AM but consider ourselves pretty fortunate. Most bird strikes occur near airports during takeoffs and landings, or during low-altitude flying. Geese and gulls are the birds most commonly involved in strikes. Flocks of birds are particularly dangerous because they can result in multiple hits. Between 1990 and 2008, more than 87,000 bird strikes to civil aircraft in the U.S. were reported to the Federal Aviation Administration (FAA); it is suspected that only 1 of 5 hits are reported. Richard Sowden, a bird and wildlife hazard specialist for the Air Canada Pilots Association, estimates that at least one bird strike happens each day in North America that is serious enough to require an aircraft to stop a takeoff or return for inspection. Because of growing conservation efforts and an increase in size of the bird population, strikes are also increasing in number. Did you ever experience a bird strike? Scary, Irene. I’m like you. I’ve flown enough that I have antennae for anything that seems out of the ordinary. If you think about it, many airports seem to be next to a body of water. In Philadelphia, planes fly up (or down) the Delaware River right before landing and after take-off and the airport is immediately adjacent to the John Heinz National Wildlife Refuge at Tinicum which consists of marshland which, according to Wikipedia, was rescued from development by — birdwatchers. My son had a college friend who was on that flight that ended up in the Hudson River. The best strategy seems to be to tuck these incidents in the back of our minds:-) Thankfully, they are relatively rare. My husband was on a flight from Chicago to Spain that had its windshield broken by a bird strike. They had to land somewhere and spend the night. We were supposed to meet in Barcelona to go on a cruise, and I ended up doing the first night on the ship solo before he caught up with the boat. Wow, that was a big inconvenience! Very interesting post – please to hear it all worked it for you! Scary, Irene. Thank goodness all worked out well. I bet you’ll never tease Jerry again about the picture taking out of the window! It’s really surprising how many bird strikes happen. That’s quite a dent in the wing — cool that your husband got a photo and I’m glad that your BASH story ended safely.